When I was growing up during the years we lived in central Florida, my mother was a special education teacher. Her class had children in it who could not be put in mainstream classrooms - not even by today's more lenient standards. I asked my mom to let me go to the school where she taught, even though we lived less than two blocks from an elementary school. Every day after my class got out, I went to my mom's classroom and we would often have a student or two or three who remained at school for a variety of reasons. It wasn't unusual for mom to give students a ride home or assist their parents on errands. In one instance, I recall taking a profoundly deaf boy (with severe anxiety if I remember the situation accurately) to be fitted with new hearing aids. He screamed almost the entire time until his hearing aids were fitted. 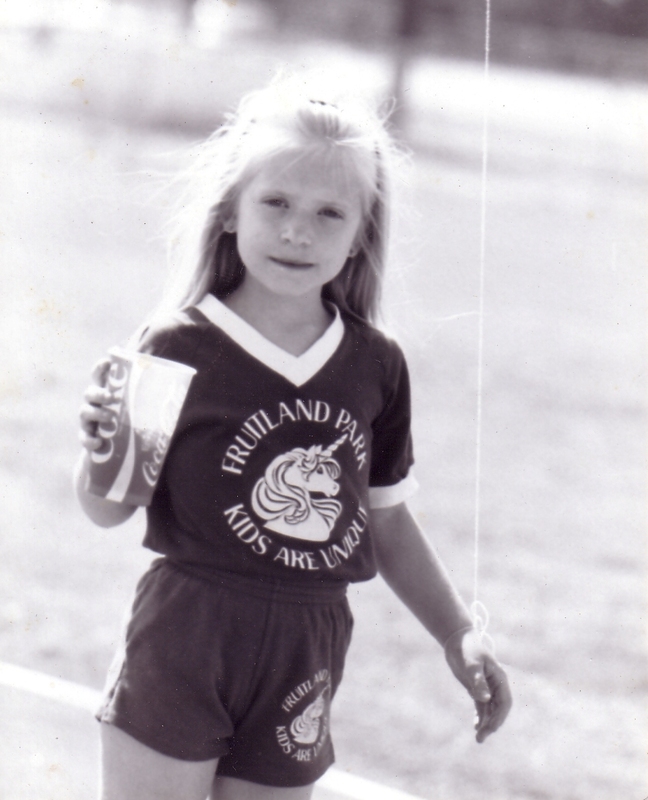 1983 - I proudly wore my school's colours (kelly green) and mascot at the Special Olympics. We always went when mom had students participating. I am not a teacher. I couldn't do the kind of work my mother did. But I learned so much from the care she took with the students in her class. I learned that children can be born with any number of challenges that may or may not be obvious at first. By far, the most important thing that I learned (even back then) is that there is help and people do care. There is not much in the world that's cuter than a dinosaur at the dinner table. I've never been more thankful for being the daughter, sister and sister-in-law of special educators than I was on December 12th when I was told that my son has PDD-NOS. It was expected. I heard the words finally and I knew what I had to work with. There were no tears or regrets about anything I've done. I didn't feel a need to grieve over any aspect of Brandon's diagnosis. He has autism, but his future is as bright as it ever was. Brandon's diagnosis changes little about what we're doing, except that more services open up to us with his diagnosis, but we were already on the right track. We will keep going the way we have been and I'm confident he'll continue to make really good progress. I couldn't be prouder of him than I am. He is a truly sweet child with a lovely disposition (most of the time). He's funny and smart and so happy. It's exciting to watch this amazing little person growing up and learning new things. He will be fantastic - I have no doubt about it.